Rocks are rather wonderful. They cover the earth. They can be found on the playground, in the dirt and in the soil. Rocks can be found on mountains, in caves, under the ocean, in the desert and near volcanoes. Rocks come in all different colors, shapes, sizes and textures. Rocks are made from minerals. The minerals make a rock look and feel rough or smooth, hard or soft, beige or black or brown. Some rocks fit smoothly into the palm of our hands. Some we can skip gaily across the surface of the water. Skip! Skip! Skip! Plop! Some rocks are climbing rocks to help you on your way. Others are stepping stones crossing creeks and rivers. 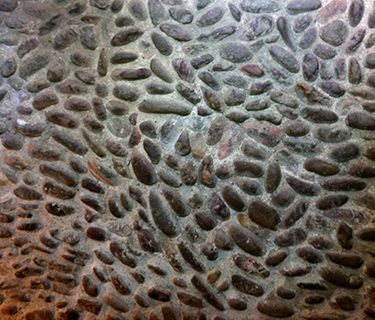 Some rocks have unusual shapes and may have been carved by people who lived before you. If you find a soft, dusty rock, you can use it to write on the sidewalk like chalk. 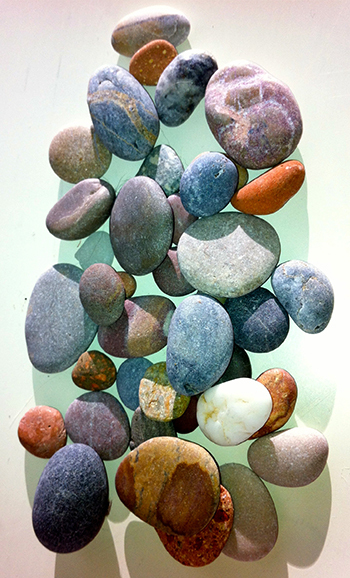 Little pebble rocks can be sifted through your fingers or lined up to spell a message on the ground. You might find a magic rock, shiny and dark or white and sparkly. Some rocks have stripes on them. 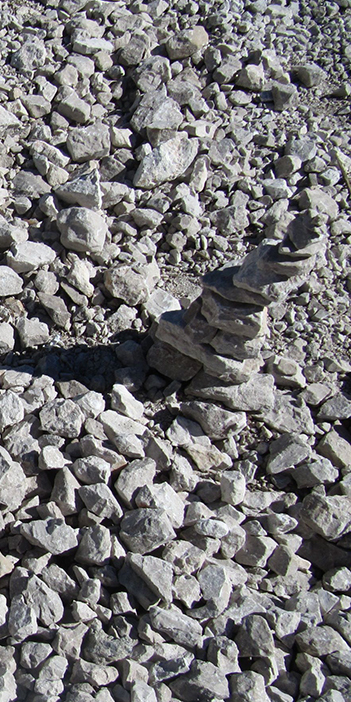 You can make rock towers! Bigger rocks can be splashing rocks when you toss them in the lake! Rocks across a shallow creek or river become stepping-stones. Rocks covered with moss can give you a nice soft place to sit. If you turn over a rock you may be surprised to find a small living city of creepy, crawly things! Some rocks we can pick up and scratch messages on other rocks or hard surfaces. We can draw a picture with others or find pictures of leaves, fish, insects and plants petrified inside rocks in the form of fossils. Sometimes you can find a special ‘make a wish’ rock or return to a good 'thinking rock’. If you look closely, you will find that rocks are very beautiful and have stories to tell. Rocks are special because most of the time, they are very old. Inside they hold the history of where they came from and how they were made. They tell the story of the origins and age of the earth. Remember, rocks have memory! Rocks are always changing. The changing of rocks by wind, water and ice is known as weathering. Wind, water and ice carry rocks away. This is called erosion. Look at the rock cycle animation and discover the three types of rocks-sedimentary, igneous and metamorphic. Rocks that are carried away and sink to the bottom of riverbeds become buried over the centuries by other layers of rocks. Weight, pressure and time fuse the lower levels of collected rocks into a solid layer of rock we now call sedimentary rocks. Rock that is melted under extreme temperatures in the earth’s mantle is known underground as magma, on top of the ground as lava and when cooled and hardened, as igneous rock. A third type of rock, metamorphic, forms under the earth’s surface when weight, pressure, heat or chemical action squeeze, heat, or fold rocks. Make a chart for these three types of rocks. Test your knowledge with the Rock Cycle Quiz. Show a sectional drawing of how they are formed and make a diagram of the rock cycle. Rock words help to tell the scale of the rock. Think about how many rock words you already know. Make a Rock Word poster. Start with the smallest word you can think of. Perhaps it will be a speck. Small specks become dust. A grain is just a little larger. Sand is actually small rock on the beach. A pebble is big enough to cause discomfort when stuck in your shoe! A stone you can hold in your hand and can come in many colors and shapes. River rocks are wonderful smooth rocks formed by streams and waves rocking them against other rocks. A rock suggests a larger mass that is hard for you to move. A boulder is usually taller than you and very difficult for several people to even budge! A mountain is the largest rock and can be found under and above the ocean. Make a drawing of these different scales of rocks. Find some rocks. Take a closer look to reveal their type, their process of formation and even their mineral matter! If a rock is rounded, it has been subject to sand, wind or water making its edges smooth. If it is sharp it can tell us of its brittleness or ease of breaking. If it is impossible to crack it reveals its strength. If it has very small finely mixed particles, it was probably cooled very quickly. If it has large crystal pieces, it probably cooled slowly. If a rock can scratch another material, it is said to have mineral hardness. There are ten mineral hardness scales starting with talc and gypsum as the softest and ending with diamond as the hardest. Become a rock collector. Take a picture of your rock where you found it. Make a careful sketch of your rock noting all of its important features. Bring your rocks home carefully and wash them gently with an old toothbrush. Using a rock book or rock identification chart, determine the types of rocks that you have found Take their pictures and mount them on a chart that tells about particle size, color, hardness, and other features. Sedimentary rocks are layers of rocks and other materials pressed together over long periods of time. There are three general types of sedimentary rocks: classic sedimentary rocks formed by weathering debris; chemical sedimentary rocks formed when dissolved materials are pressed together; and thirdly, organic sedimentary rocks formed by decaying animal and plant debris. Conglomerate sedimentary rocks reveal different pieces of rocks surrounded by other material, or in the case of sandstone, different sand size particles. Conglomerate rocks reveal their mixes and their mixes reveal where they came from. Sandstone comes from wetlands, beaches, or seaside. Chemical sedimentary rocks include rock salt, iron ore, limestone and others. Chemical sedimentary rocks form from calcium collections of shells, coral, algae and other waste materials. Organic sedimentary rocks include shale, coal and others. Make a poster of sedimentary rock categories and types. Draw, photograph, or watercolor the three types and under each type list and depict specific rocks and their uses. Igneous rocks are called fire rocks, as they are a combination of rocks and debris melted under high temperatures and extreme pressures above or underground. Above ground cooling produces extrusive igneous rocks and below ground produces intrusive igneous rocks. Underground, melted rock, or magma, becomes trapped in small pockets. Sometimes these pockets of hot rocks are filled with gas under pressure. The pockets that slowly cool develop large, well-formed crystals. The pockets that cool rapidly consist of small, poorly formed crystals. Sometimes hot, liquid magma explodes out of volcanoes and becomes mixed with air and even cold water. Magma above earth is known as lava and turns into different types of extrusive igneous rocks as it cools on the earth’s surface. Make an igneous rock poster. Show the two types. Draw, photograph, or watercolor the above and underground types of igneous rocks. Under each category list and depict rock types and their uses. Metamorphic rocks are rocks that have ‘morphed’ or changed in form. Metamorphic rocks can start as sedimentary rocks and/or igneous rocks but then are squeezed, folded, and pressed under extreme weight, heat and/or pressure. These rocks come in two categories: layered or foliated metamorphic rocks and non-foliated metamorphic rocks. Make a metamorphic rock poster. Draw, photograph, or watercolor the layered and non-layered types of metamorphic rocks. Under each category list and depict rock types and their uses. Rocks are used to build houses, buildings, sidewalks, streets,and bridges. Rocks are also used to make jewelry. People who study rocks are called geologists. You can be a geologist and go looking for rocks. Some rocks are hard. Some rocks are soft. Some are heavy and some are light. Some are round and others are brittle and sharp. All of these characteristics are determined by which minerals are in the rock. People have discovered over the centuries the best rocks to use for different purposes. Research the use of rock and fill a page in your journal of rock uses and their types. Rocks are made of at least two minerals. How many types of sedimentary rocks are there? The color of rocks can help tell us where the rocks came from.